UMD Assistant Professor Yiping Qi in the Department of Plant Science and Landscape Architecture received a $1.1 million Plant Genome Research Program Early Career Award from the National Science Foundation (NSF) to continue his unique work developing tools for researchers to perfect CRISPR and apply these technologies to gene regulation in a variety of worldwide crop systems. 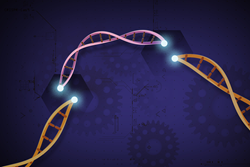 Qi’s work, specifically using the rice genome as a test platform, is providing practical tools to enhance gene editing technologies like CRISPR and improve the specificity of genetic “cuts” that are made, ensuring the integrity of the entire genome. Tools from Qi’s lab are currently used by researchers in more than 36 countries around the world and counting, with the ultimate goal of advancing plant and crop yields and helping to feed a rapidly growing global population. They have the ability to turn genes “up and down” as opposed to just “on and off”, which is very practical for crop productivity and sustainability. Continued development of these tools will not only aid basic research, but allow scientists to seek novel solutions to global challenges such as devastating plant diseases, economical bioenergy production, sustainable agriculture, and climate change. The concept of gene editing is not a new one, and has been accomplished with cross-breeding since humans first cultivated plants for agricultural purposes. However, given the increasing population, food security is a growing concern, and new emerging issues are arising for crop and food production. There is a need to feed a projected population of 9.6 billion people by 2050 with little to no new agricultural land, meaning that yields for major crops need to be improved in other ways. CRISPR, as a new precision breeding technology, will enable scientists and breeders alike to do the same things done with traditional cross-breeding programs in a much shorter amount of time to account for new issues like disease resistance, pests, heat, drought, and other major concerns of a changing climate and growing population. With this grant, even though Qi is working directly with rice to improve crop traits and yields, his work is focused primarily on developing and disseminating the tools and technologies necessary for researchers around the world to directly apply to all kinds of crops. Tools are made available to researchers through a public repository called Addgene. To this effect, Qi has been an advocate in the scientific community, publishing multiple scientific papers over the last few years related to gene regulation tools (e.g., Plant Physiology, Nature Plants, Molecular Plant) and frequently attending talks and meetings to further promote his research. Not only did he just return from the NSF awardee meeting in early September for this new grant where he gave a talk on the existing tools they have developed for the research community, but he was in Budapest the same week giving multiple talks on plant genome editing, both to public and academic audiences.